2 Terror isn't the best, in general and 1 skill hurts. I can see it working very nicely in some cases such as Lord Jeffrey Farrington, but overall see this as a card that needs to fit into a very specific deck, with many beneficial forced responses. For general play its not great. Not all forced responses can be duplicated, almost all in faction repeatable forced responses will cause your opponent to discard a card and that is not worth sacrificing a character for. Out of faction you are most likely to get rid of an opponent's character, a one for one swap isn't a great bargain. 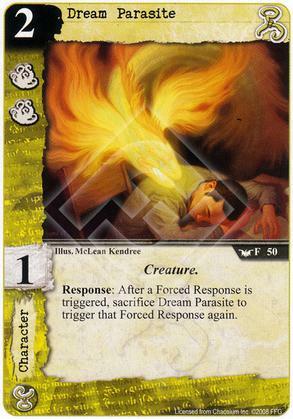 Hastur's problem is characters with nothing but terror icons, a character that is only useful in 25% of matchups isn't a good card unless it has a really good ability and this card doesn't. This may get better when the deluxe arrives. The cost and stats are mediocre at best, and the trigger isn't worth sacrificing for. If this ability was triggered via a Lunatic I could see playing it. Right now there just aren't any effects I want to abuse to make use of this. Wilbur Whateley is probably the best partner for Dream Parasite, especially if it gets you that elusive 4th success token.